We actively encourage Shine editorial teams to think about ways in which their project can positively affect the people in their local community. This goes hand in hand with a consideration of your environment, whether it be right in front of you at school and home or on a wider, even global scale. Shine’s community and environmental award recognises a consistent, potentially thematic effort that combines your school project with an awareness of issues and news directly affecting the local population. … so if this award is one you’re keen to enter, it’s worth keeping an eye on your project from an overall editorial perspective. If the finished project has a number of pieces with a core focus, or discovers more about your community and highlights issues important to them in an investigative way this would form the basis of a very strong entry. Setting out your objectives in terms of engaging with the local community at the beginning of your project could be a great way of defining it. Equally it could be that as you progress with writing pieces for the project, issues become apparent you previously weren’t aware of. That’s a natural part of journalism and a ‘crusade’ that helps people and came about because of your journalism is an excellent outcome. Ask questions! Find out what’s going on! Get inspired! One way of finding out about big issues on your doorstep is to ask people who are really in touch with the local population. We’d suggest requesting interviews with people who have something interesting to say. How about local politicians, religious leaders or business owners? All or any of these people could form a very sound starting point for your work. And best of all: they usually like the attention! Past winners of this award have approached it in two ways. The first is to write articles themed around environmental issues. For instance, following the impact of the TV series Blue Planet II, many newspapers adopted a cause of using less plastic in our everyday lives. You might consider environmental issues at your school and how your project can raise awareness of these. This would be particularly relevant for a website or podcast where there was no final printed product. “While filming Blue Planet II the crews found plastic in every ocean. Even in the most remote locations. “Once in the ocean, plastic breaks down into tiny fragments, micro plastics. Along with all industrial chemicals which have drained into the ocean these form a potentially toxic soup. “Industrial pollution and the discarding of plastic waste must be tackled for the sake of all life in the ocean. Misconceptions about print and paper are a major issue for the printing industry. All too often organisations use messages such as; ‘Go Green – Go Paperless’ and ‘Do your bit for the environment and choose e-billing’. Such messages can be unsubstantiated, misleading and can have a lasting effect on consumer perceptions of print and paper. In fact, the print and paper industry is a world leader when it comes to sustainably-managed materials, renewable energy and recycling. 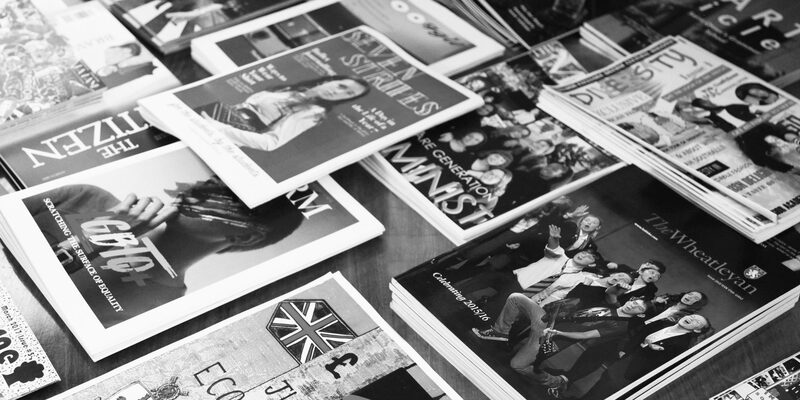 The ‘Two Sides’ campaign sets out the facts about print media’s sustainability. Between 2005 and 2015, European forests grew by an area the size of Switzerland – that’s 1,500 football pitches every day!